Clustering slender rattan climbing to 15 m; stem without sheaths c. 6 mm diam., with sheaths to c. 10 mm diam., internodes c. 12 cm. All parts drying dark brown. Sheath dark green armed with scattered bulbous swellings, some ending in minute spines, pale brown indumentum also scattered over the sheath surface; knee conspicuous, often with an annular swelling below it; ocrea inconspicuous. Flagellum to 80 cm. 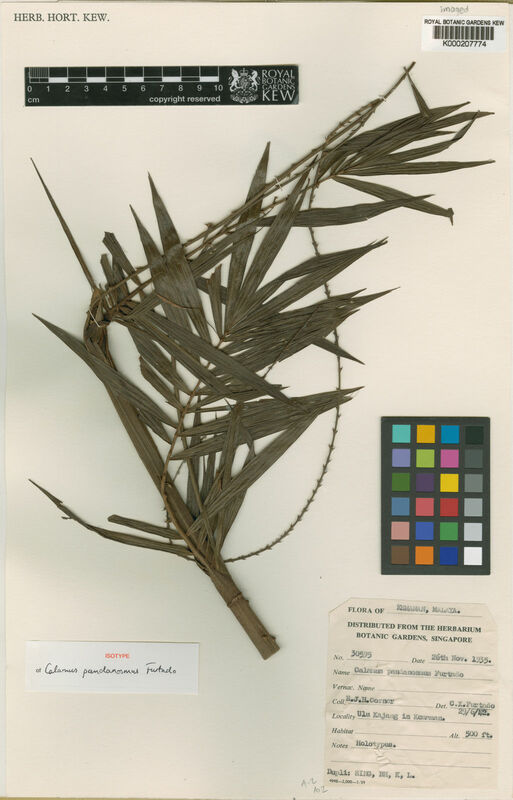 Leaf ecirrate and lacking a petiole, the whole to 45 cm, with c. 8 leaflets on each side of the rachis, the terminal pair joined for at least 114 their length, other leaflets somewhat irregularly arranged, leaflets dark green, faintly pandan-scented when crushed, the longest to 25 x 3 cm. Inflorescence to 1 m, with up to 8 curving partial inflorescences, each with curving rachillae. Flowers relatively large, to 4 mm, sweetly fragrant, pollen orange. Mature fruit somewhat oblate, to 17 x 19 mm, covered in 23 vertical rows of pale brown scales. Seed c. 10 mm diam., endosperm deeply ruminate. Seedling leaf not known (Fig. 79). Known from a single population from G Pueh, 1st Division. Elsewhere known from two collections in Sabah, and a few collections from Peninsular Malaysia, S Thailand and Sumatra.